Hello! Today we are excited to share a card pairing our Wood paper and Tonic Studios Nuvo products. When when saw the line up of Tonic Studios new products, we had to get in touch with our friends over there to try them out with our Wood paper. Tonic Studios has so many great lines of products perfect for any crafter. We got a chance to play around with some of the products from the Nuvo lines and Rococco Dies. 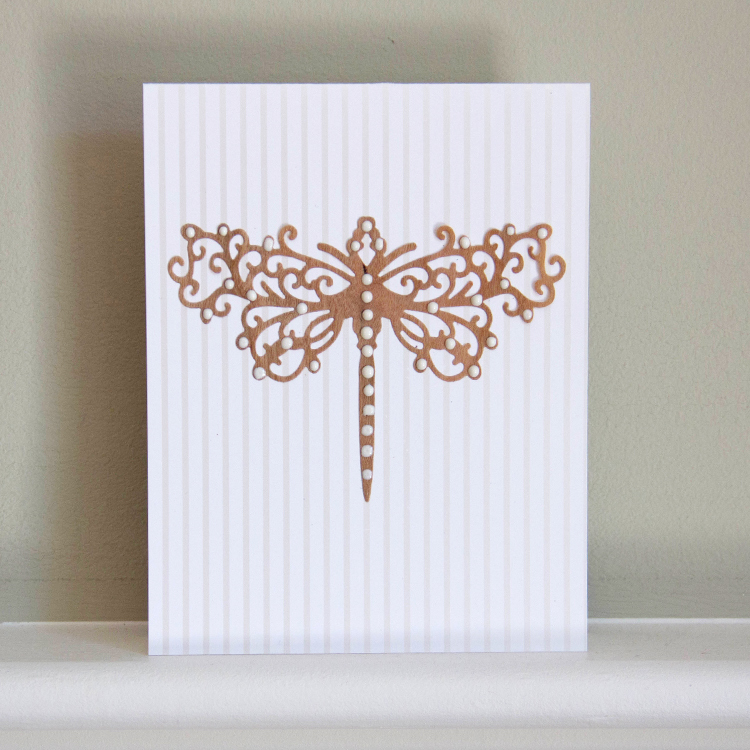 Check out this gorgeous and super simple card we created! The Rococco Dies have so much detail and are very intricate. As usual, our paper cuts beautifully with dies! We cut our Cherry Wood paper using the Dragonfly Brooch Die. Look at the result! This Cherry Wood Dragonfly is so beautiful. We decided to embellish the Cherry Wood Dragonfly with a little Nuvo Crystal Drops. These Crystal drops are amazing and allow you to add three dimensional pearly beads quickly and easily in all sizes. Above we used Gloss White Nuvo Crystal Drops. With the sample below we paired the Cherry Wood Dragonfly with a little Crushed Grape Nuvo Crystal drops. A little bit of Wood paper and Crystal Drops can really make a statement, right?! Be sure to stop back next week for more Tonic Studios love! Until then, here’s a little sneak peak using a little Nuvo Pure Sheen Glitter! This entry was posted in Crafts & Kits, DIY Projects and tagged 3D, cherry, crystal drops, Nuvo, scrapbooking, tonic studios.